I have noticed that many people using our property search tool often use the zip codes in Tallahassee as a way to target their preferred location. This is a quick way to reduce the thousands of properties down to a manageable amount, and we can also use these postal designations as a way to evaluate the different locations within the Tallahassee real estate market. 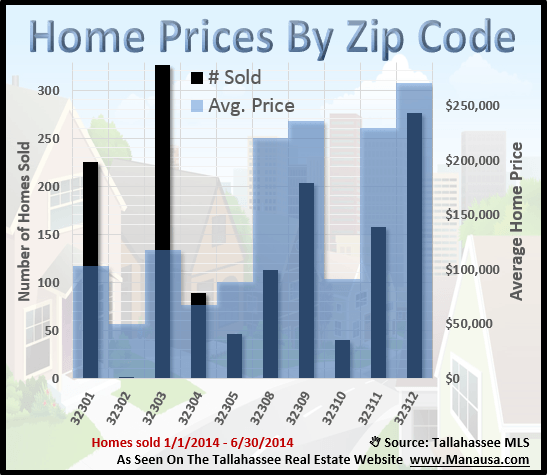 This report examines home sales, home values, home prices, and distressed home sales in the most popular Tallahassee zip codes. The following real estate graph shows the number of homes sold in each zip code, as well as the average home sales price. Unit sales are shown as black bars and measured on the left vertical axis, while average home prices are shown in blue and measured on the right vertical axis. The 32312 zip code had the highest average sales price for the first half of 2014, which is no different than what we saw last year. Through June, there have been 276 homes sold at an average price of $271,126 in this popular NE Tallahassee neighborhood. This next graph shows the number of homes sold in each zip code, as well as the average home value. Unit sales are shown as black bars and measured on the left vertical axis, while average home values are shown in green and measured in price per square foot on the right vertical axis. 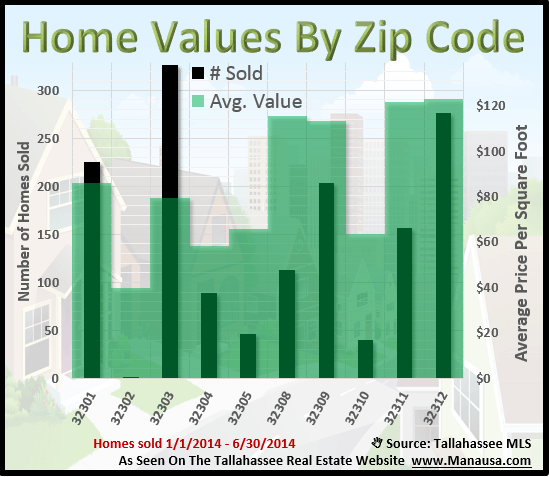 The top valued zip codes in Tallahassee are 32312, 32311, 32308 and 32309. They show home values worth $123 per square foot down to $113 per square foot, and all are in the eastern half of Leon County. This graph shows the number of homes sold in each zip code, as well as the average home size sold. Unit sales are shown as black bars and measured on the left vertical axis, while average home sizes are shown in red and measured in heated and cooled square feet (on the right vertical axis). 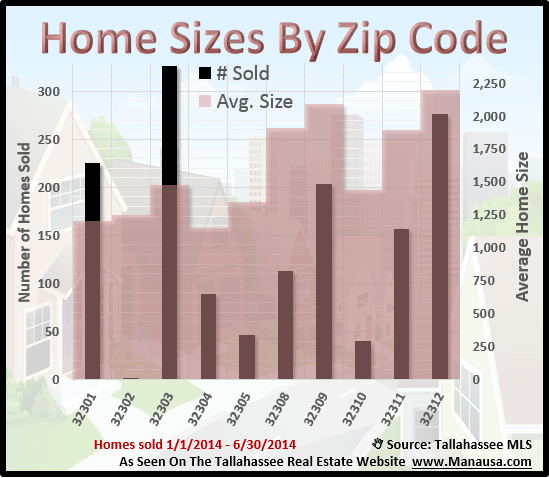 There are no big surprises when we look at home sizes in Tallahassee, as the big four zip codes (32308, 32309, 32311, and 32312) host the largest homes in town. It is interesting to note that 32303 and 32301 have a large number of home sales, but many of these are student rental properties, and that is why their size and value are much lower than what we find on the eastern side of town. Our final graph shows the amount of distressed home sales in each zip code, measured as a percentage of all home sales. Currently, only the 32303 zip code is showing improvement over last year. The 32301 zip code is approaching 60% of all homes sold as either short sales, foreclosures, or bank owned properties. While this is holding values back, it is a necessary step in the housing market recovery. 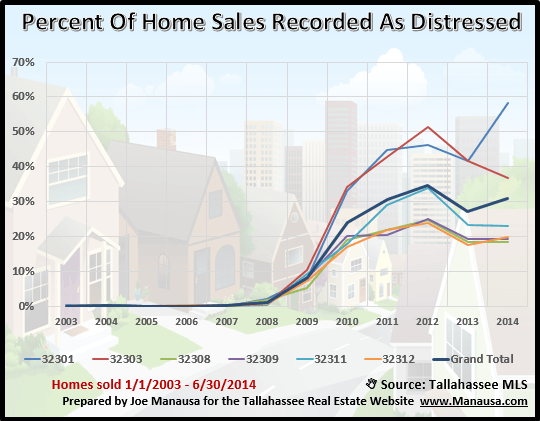 Distressed homes need to be sold so that equity sellers can become active in all Tallahassee zip code regions. I hope you have a better feel for the most popular zip codes in Tallahassee. If you would like to know more about a certain Tallahassee zip code, just drop me a note and we will help you understand the real estate market in your desired area.